Because it’s resistant to moisture absorption, Freelin-Wade’s nylon tubing is more corrosion resistant than other types of nylon tubing. It is heat and UV stabilized, making it resistant to stress-cracking, and so is ideal for use in outdoor applications with constant sun exposure. When compared to other nylon resins, this nylon tubing is also highly chemical resistant. 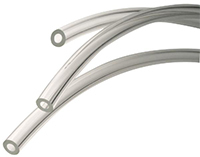 Freelin-Wade’s non-reinforced clear PVC tubing is manufactured using a safe, non-phthalate plasticizer. Their clear PVC tubing features a smooth interior and exterior surface that prevents sediment accumulation and resists bacterial growth. It is FDA-approved for food contact, Cal Prop 65 compliant, and meets USPVI testing requirements. This makes This vinyl tubing ideal for food and beverage, medical, pharmaceutical, and other clean-critical industries. 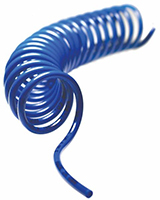 Nylon tubing mini coils are tough and abrasion resistant, and the coiled material provides extreme flexibility. Nylon coiled tubing also offers excellent return and coil memory, and mini nylon tube coils are rated for working pressures as high as 298 psi. Unlike the full-size nylon tubing, nylon mini coils are not equipped with fittings. Polyethylene tubing is flexible, lightweight, durable, and corrosion resistant. Polyethylene tubing, also known as poly tubing or PE tubing, is an effective solution for a wide range of liquid, gas, and fluid transfer applications. PE tubing is FDA approved for food and beverage applications. Freelin-Wade offers linear low density polyethylene (LLDPE) tubing, as well as their proprietary, extra-flexible Liquiflex POE polyethylene tubing. Clayton Controls is a Freelin-Wade tubing distributor in California. We offer technical support to help our customers solve their applications.